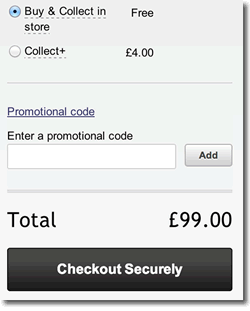 As a way of increasing sales, retailers offer customers voucher codes. They are often distributed to various websites and portals that have an audience to share them with. Voucher codes can be used at the retailer’s checkout by simply entering the code before making a purchase. The basket value (in most cases) will then be updated to reflect the value of the voucher code. The point at which the voucher code is entered during a purchase often varies for each retailer, so be careful to look out for where to enter the code. At CollectOffers, we also display any deals from retailers. For example: 10% discount for Students, or buy one get one free are types of deals. These type of offers (deals), do not require a voucher code and should be visible on the retailers website before a purchase is made. At CollectOffers we take care to ensure that offers are clearly labeled as current or expired, but please do check before making your purchase. As well as deals, sales from retailers do not require a voucher code to be entered. We check our retailers websites regularly to find out when a sale in on, but we cannot always be sure when the sale has ended. Although we do our best and check the retailers websites regularly! Please be sure to check that a sale is still current before making a purchase. Many of our retailers offer cash-back, either on specific products or over a certain spend. The terms and conditions for claiming the cash back vary from retailer to retailer. Some may offer the cash back at the point of sale, whereas others after the purchase have been made (sometimes months). Please be sure to read the cash back terms and conditions on the retailers website before making your purchase. A great way of saving online is by avoiding expensive delivery charges. Where possible, we display retailers offering Free Delivery – whether its for all purchases, or those over a certain value. The easiest way of finding codes at CollectOffers is to use our search option. Just type in the name of the retailer on the CollectOffers home page and click search. Alternatively, you can search for retailers using our A-Z (a link can be found at the top of the site). Or if you are looking for the latest deals, categories or restaurant vouchers, try out our other search options to find a retailer. Using voucher codes is one of the best and easiest ways of saving money on your purchases. You simply "Collect" the voucher code from our site and then use the code when you make a purchase on the retailers website. Voucher codes are easy to spot on the CollectOffers website. Just look for the voucher icon listed beside the retailer. Cut and paste the voucher code displayed and visit the retailer. A new window will already have been opened with the website you want to visit. The basket value should be updated at the point it has been added to reflect the value of the voucher code / promotional code. Our online codes can only be used online and not in store. 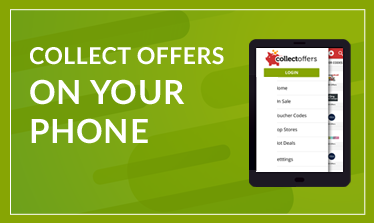 At CollectOffers we have created a mobile app to help you save when you are on the move or away from your desktop. It display all the offers available on our website, and includes mobile vouchers and printable vouchers that can be used on the high street. You can find our Android App on Google Play. Just click on the link below and install to your device. You can find our iPhone app on the iTunes App Store. Just click on the link below and download the App to your iPhone.